Pictures of Budapest Basilica. 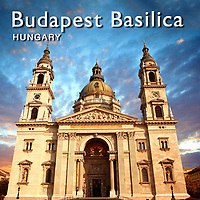 Images & photos of Budapest Neo Classic Cathedral. Also buy stock photos & photo art prints. St. Stephen's Basilica (Hungarian: Szent István-bazilika) is a Roman Catholic basilica in Budapest, Hungary. It is named in honour of Stephen, the first King of Hungary (c 975-1038), whose mummified fist is housed in the reliquary. The architectural style is Neo-Classical; it has a Greek cross ground plan. The façade is anchored by two large bell towers. In the southern tower is Hungary's biggest bell, weighing over 9 tonnes (8.9 long tons; 9.9 short tons) . Its predecessor had a weight of almost 8 tonnes (7.9 long tons; 8.8 short tons), but it was used for military purposes during World War II. Visitors may access the dome by elevators or by climbing 364 stairs for a 360° view overlooking Budapest.